I traveled to Guatemala four times in the early 2000's. I watched “Living on One” and was gobsmacked. The guys live in Pina Blanca, not far from Aguas Caliente which is one of the MayaWorks weaving communities. I recognized one of the weavers in the show. I had stayed with the family of one of the MayaWorks weavers for a long weekend two year in a row. Only 6 days living their lives, but boy, watching Living On One (dollar a day) took me back to those eye-opening experiences with those beautiful, gracious people. Today I found what I wrote in 2004 about how to make corn tortillas. Because if we make them ourselves here in the US we tell ourselves we saved maybe a dollar or two – until we understand not what we are saving, but what we are receiving. 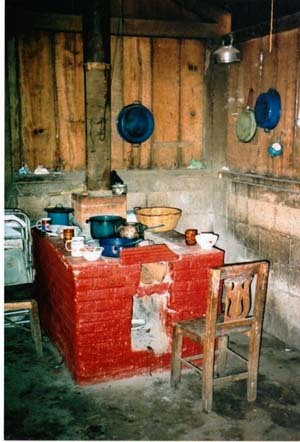 This is how you make tortillas in Central America. When the corn is ripe, pick and husk it all by hand, then dump it in your corn crib. This stash, for the most part, is what stands between your family and hunger until next year's harvest. Every afternoon fill a seed sack with a half-bushel of the dried corn. Whack this bag with a club until the corn falls off the cobs. Pick through everything, separate out the corn, save the cobs for your cooking fire. Carry a dish tub of corn, probably on your head, to the person in your community who owns a "molina" - a steel grinding machine. Pay her a nickel to grind your corn into meal. Back home, mix the cornmeal into water into which a little "cal" has been added. Cal is ground-up limestone from the mountain; you buy it in the market because it helps cornmeal cook softer and faster. It also (this is so cool) adds trace amounts of calcium to your diet which is one reason Maya people rarely suffer osteoporosis even though they seldom eat dairy products. Bring the mixture to a boil and then simmer in a big pot over an outdoor cooking fire. You do this outside because you can't get a pot that big to a boil on your inside wood-fueled cook top. Stir the pot from time to time to keep everything from scorching. About an hour later, pull the pot off the fire. Cover it with a cloth, put it somewhere animals can't get into it. Let it cool overnight. In the morning you must make tortillas before your husband and/or sons leave for work. Many men work an hour or two away, so leave they leave the house by 6:00 to 7:00. You need to have enough tortillas made by then so your men can fill their bellies, plus have another dozen or so tortillas for each to take with to eat during the day. Stir the dough with your hands a bit. Take a golf ball-sized lump of it, pat the lump flat, round off the edges, slap the tortilla on the hot flat surface of the stove top. When it's cooked just enough, flip it over. Be careful to not burn your fingers. Keep doing this until you have made between 5 and 25 tortillas for every member of your family. The bigger the nutritional needs of each family member and the fewer other foods you have to give them that day -- this determines how many tortillas you make. There are 12 people in the extended family with whom I stayed in Guatemala. The mother of this family, plus her daughter-in-law work together to make more than 100 tortillas a day. This takes about two hours each morning in and around all their other chores. The tortillas are delicious and filling. They will be served with black beans if available (also grown on the milpa), perhaps a salsa made of tomatoes and/or greens and/or chilies. One of the things that struck me as I watched, helped (oh yeah, you can imagine how big a help I was...), and ate corn tortillas was this. Is there any calorie gain in this process? Doña Vicenta probably spent as many calories making tortillas as she gained from eating them. Her husband and sons did the same, working in their milpas when they weren't working elsewhere. Here's the original human economy, isn't it? Work hard enough to produce the food you will need to work hard enough to produce the food. What's going on when eating becomes gluttony? Eating is what we do because we are earthly creatures assembled from earthly elements. We get vitamins, minerals, and energy from the plants that grow up out of our earth, or we short-cut the process by eating animals that munched on the plants. Eating is the on-going chemistry of the universe, with whipped cream and a cherry on top. What occurred to me as I did my comical best to pat out round, even tortillas (even is a hard quality to master), is this. When food becomes a commodity that we purchase and consume, it's easy to buy too much, cook too much, and eat too much. I don't want to wax poetic about the labor it is to make tortillas, or any of the other life-sustaining foods most of earth's folks prepare and eat every day. Doña Vicenta was certainly not sentimental about this work. I wondered what else she could do with her life if 12 people did not depend on her for this. But she does it. Her family comes and goes; they talk with her and each other. Morning rises in the aroma of fresh, warm, corn tortillas. Maybe what we need to combat gluttony is not more self-discipline or a better reducing diet. Maybe what we need is some appreciation for the food that arrives to our plate and our palate.